Philanthropist Darren Walker is the tenth president of the seventy-seven-year-old Ford Foundation, the second largest philanthropy in the world. Walker was born August 28, 1959, at a charity hospital in Lafayette, Louisiana, to a single mother and was raised in East Texas. He received two degrees from the University of Texas at Austin, graduating first with a bachelor of arts in government in 1982 and again in 1986 with a Juris Doctor from its School of Law. Walker started his career in international law and finance at the New York city law firm, Cleary, Gottlieb, Steen & Hamilton, in 1986. In 1988 he joined the Union Bank of Switzerland (UBS), dedicating seven years to its capital markets division before separating to volunteer full time at the Children’s Storefront, an elementary school serving low-income families in Harlem. In the 1990s, Walker served as COO for the Abyssinian Development Corporation (ADC), Harlem’s largest community development organization. 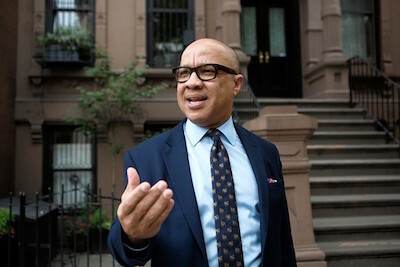 He managed a comprehensive revitalization program that erected over one thousand new housing units, which served as Harlem’s first commercial development in twenty years. He is a strong advocate for the Ford Foundation as he benefited early on from its Head Start programs at the age of five in Old Goose Creek, Texas; graduated from college with the help of the Federal Pell Grant program; and received Ford grants for the Abyssinian Development Corporation when he led its community revitalization efforts as COO. Prior to joining Ford, Darren Walker was the Rockefeller Foundation’s vice president for United States and international initiatives from 2002 to 2010. He led the Rockefeller Foundation’s work in supporting innovations that sustained assets of the poor, built economic development, and created long-term strategies that addressed increasing global migration, movements, and urbanization. Walker oversaw the Rebuild New Orleans Initiative after Hurricane Katrina, and managed more than $140 million in annual grant moneys delegated to areas like media and journalism, sexuality and reproductive health and rights, educational access and opportunity, religion, and art and culture. Before becoming vice-president, he served as director of the foundation’s communities’ program, for which he oversaw a grant-making portfolio in excess of $25 million per year, money that created anti-poverty strategies focusing specifically on sustainable community development, education, employment, and building democracy in the United States. Since being named president of the Ford Foundation, Darren Walker has worked to implement radical changes toward inequality and fostering social justice alongside his domestic partner David Beitzel, a family law attorney. Darren Walker, Vice President of Foundation Initiatives, Rockefeller Foundation, http://philanthropynewsdigest.org/5-questions-for/darren-walker-rockefeller-foundation; Darren Walker Promoted To President At Ford Foundation, http://www.thenonprofittimes.com/news-articles/darren-walker-promoted-to-president-at-ford-foundation/; The Rockefeller Foundation Appoints Darren Walker To Head Its Working Communities Division, http://www.prnewswire.com/news-releases/the-rockefeller-foundation-appoints-darren-walker-to-head-its-working-communities-division-75304867.html.